It’s been a little more than seven months since the 2016 presidential election where America legitimately elected Donald Trump the 45th President of the United States. But not to Hillary Clinton, the losing candidate and her party. It seems as if every time a Democrat opens their mouths it’s to invent another reason fake reason for her loss. It is all an attempt to de-legitimize the Trump victory and to deflect people away from realizing that Hillary was incompetent. Well …until now. Gee whiz, is he saying that Barack Obama was a narcissist who didn’t care about anything but himself? Hard to disagree with that. 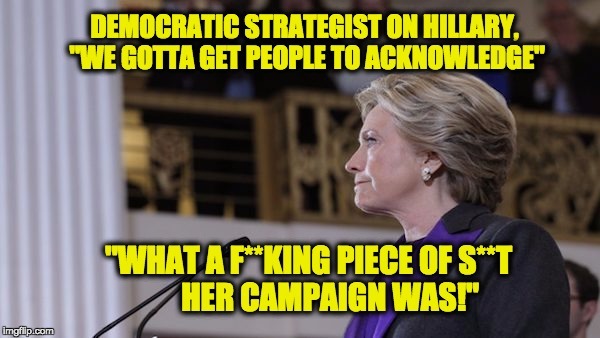 Hillary ran a lousy campaign and she was a lousy candidate who was out of touch with the electorate. While it’s nothing new, but once in a while it is nice to hear a Democrat say it.